She was orienteering when she lost consciousness. SAN DIEGO (KGTV) - A San Diego man walked up to a horrifying sight: his wife bloodied and unconscious in Balboa Park. Donna Gookin and her husband Ed were part of a group participating in orienteering last Wednesday in the early evening. Orienteering is hiking sport that combines a compass, a map and locating markers. The two were on separate parts of the trail. Not far from the Cabrillo Bridge, Ed found a cluster of emergency personnel around his wife, unconscious and about two feet from a pool of blood. "Scared and fearing the worst. I may have lost my wife," said Ed Gookin. His wife survived but suffered several fractures in her eye socket and bleeding in her brain. She remembers regaining consciousness in the hospital the next day. "A headache and wondering what happened," said Donna Gookin. Her last memory was choosing to go on a less steep path. But her husband doesn't believe she fell. "I think somebody hit her. Somebody clubbed her," said Ed. He says his wife, who has thin skin, had no injuries on her body. "She would have been very bloodied and torn up, because of her skin, if she had ... fallen," said Ed. Ed also points out her clothes were not sandy and there were no rocks near her that could have caused her injury. If she was attacked, the couple hopes a witness will come forward. "I want other people to be safe and think they would be safe walking on the trails in Balboa Park," said Donna. 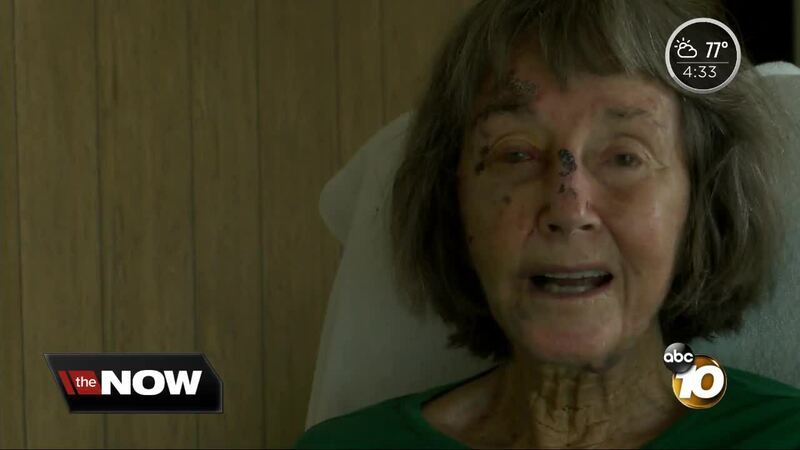 10News recently profiled an 81-year-old man who says he was struck near his eye by a man with a rock-filled sock in North Park the night after the Balboa Park incident. Police have yet to say if they're looking into a link. If you have any information on the cases, call Crime Stoppers at 888-580-8477.